Such a peculiar meshing of her family line, Ciaran was born with more of her grandsire's colour mixed into her than her sires. While she has inherited his feathers, his teal and blue, she looks more like Minas than Nylah in colour - she has the same darker teal muzzle and darker base of her tail, closer to a deep blue. 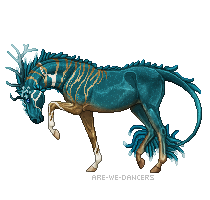 Her antlers have grown long over her years of living, taking the form of an elk's antlers and they begin the same deep teal and blue at the base and become lighter teal at the ends of the tines, almost white in some lights. The feathering she inherited from her sire will not grow to the same size as his but will still be an impressive set. They are all teal and slightly darker where they grow from the base. Only the feathering of her forehead and crest, the feathers on her hindlegs and her tail are white-tipped, a genetic colouration passed down the line from her grandsire. From her mother, she inherited some of her tan colour that can be seen upon her forelegs, right up to her chest where it begins to fade into teal along her belly and up just past the base of her neck. This tan also spans up her hindlegs on the front, to her stifles where the colour becomes teal. Along with this colour, the white markings that lace up her forelegs are similar to her mothers, but she also inherited a set of white striping along her throat and cheek, a throwback to Minas. Her eyes are as bright blue as her mother's eyes, and they miss nothing. Upon both her left and right, along her neck and her shoulders and wrapping around her legs down to the back of her knee she has a gold marking, that has the appearance of looking like liquid gold when she walks. It is a marking that is from her granddam, Kin the Golden. Her hooves are a light tan on all four limbs. She is made finer than her sire, more like her mother and her granddam, with a delicate appearance that belies the ferocity that is in her heart. Her voice claim is Aloy from Horizon Zero Dawn. When she was first born, Ciaran suffered a terrible setback - she was born struggling to breathe and if not for her sire's quick actions, she would still be suffering to this day. With his might and her mother's healing touch, Ciaran became strong quickly. She remembered feeling weak and never wanted to feel it again, and so she became steadily more ambitious and lively as she grew into a young filly. She was boisterous, often coaxing her twin Marilla to run into the world and be free from watchful eyes. This led to Ciaran meeting others of her age and becomes more brash and headstrong. When she nearly died, trapped in the ice she learned she was not invulnerable. From this though, spawned her desire to be independent. She learned that she did not need to speak her mind as often as she had, and she found she enjoyed fighting but she was better at tracking. This taught her how to be quick, and fleet of foot when it was required which in turn helped Ciaran to solidify her courage. She was always there for those who needed her when they needed her - and though she was still often quite hot-tempered and quarrelsome, she was honest and sincere in how she presented herself. A life lesson taught her that the entire world could and does change without warning. She is still willing to be a fierce friend, a fighter and loyal to any other, but she is pessimistic and does not often see what could lie ahead. She is not a leader and prefers to follow when she has found the right path, and as she grew her temper slowed and Ciaran became a quick, strong young woman who was prepared to do whatever she must, though she knows finding the right way is often clouded. Born in the world of Caeleste, in the kingdom of Hemanta known there as the Arctic Highlands, the filly was born daughter of Empress Willow and sired by Emperor Nylah Zhaoianas. She was born with a minor respiratory issue, but her sire healed it upon birth and she is clear and healthy. She was born with moisture control, but she will want it changed as she grows up - simply because she wants different things to what her family has. Here, she lived with her family and explored and learned, often finding herself wandering far from home with her twin sibling, Marilla, who she often convinced to sneak out of their home and away from the watchful eyes of her sire and dam. Ciaran showed no interest in the ideals of becoming a leader from the very first few days of her life. She met many other youngsters during her younger months, often finding herself at an impasse with them but it helped shape her. It was not long after she turned six months of age that she was wandering alone in the depths of the Highlands, practising her strengths of being nimble and fleet-footed, when she became trapped in the ice. Time passed and Ciaran felt she was going to die, so cold and feeling the beginnings of hypothermia. A lumbering shadow appeared and a behemoth rose from the blizzard - a polar bear. Ciaran felt fear for the first time, but the end never came. Instead, the bear looked at her quizzically. He then struck the ice, freeing her and carried her to the Icelight Keep. He became her companion then, bonded for life. She met many others as she grew. Her favourite was Mauna, who taught her how to fight and she, in turn, taught him about Hemanta, in her abrupt, aloof manner. She was with him when the woman who would be usurper came and challenged her father - he was not a fighter and though he was stronger than her in his sorcery, the woman won. She became Empress, and her family left Caeleste - and Ciaran felt alone. She had Mauna and she did enjoy his company, preferring it and finding herself at odds with the new regime of her home but she did not abandon it - she spent time with Mauna and enjoying the life she had. Wanderlust entered her veins as she grew older. She made her farewells from her home and left the world with Karsi at her side. Together, he taught her to track and how to follow scents of new and strange wildlife, or other equines and other living beings. Ciaran became an adept and skilled tracker, and it was what has led her to the boundary of Novus - a new world, a place she has never seen. It can only be something to learn all the more here, right? Ice Manipulation - will flesh out! 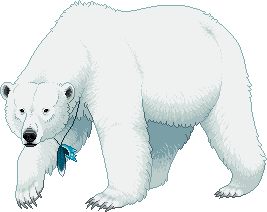 Karsi - Polar Bear - He who saved her life as a child, who wears a feather and shell around his neck to tie him to her. TRACKER | PLOTTER | Send Ciaran Zhaoiani a private message.